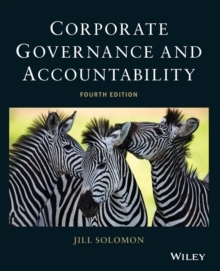 Corporate Governance and Accountability, 4e provides readers with an up-to-date summary of the most recent developments in corporate governance. Presenting a full discussion of corporate governance issues, the book adopts a holistic approach, taking the broadest view of the corporate governance agenda, including both theory and practice. The new edition is comprehensively updated and incorporates new codes of practice, policy documents and academic research. * Draws on the extensive and original research carried out by the author and demonstrates the close relationship between academic research and professional practice * Contains numerous contemporary illustrations and case studies, including a chapter dedicated to cases of corporate governance failure * Focuses on the relevance of corporate governance reform throughout the world and the need for global convergence * Highlights the importance of corporate social responsibility to companies, institutional investors and society as a whole * Questions for reflection and discussion * Chapters moulded around a one semester specialist module in corporate governance for students on any business-related undergraduate or postgraduate programme * Short case studies for discussion and debate Jill Solomon currently is Professor of Accounting and Financial Management at Henley Business School, University of Reading.